I had a friend wire 10-3 line for a new heat pump. He connected the red and black conductor wires in the house to the 2-pole 60 amp breaker and the neutral white to the neutral bus bar. The outdoor disconnect box (pictured) has terminals for 2 conductor loads, a terminal that the neutral ends at neutral. The heat pump condensing unit only has 3 terminals (L1, L2, GRD). My question is: why don't I have to run the neutral to the unit? Should I disconnect it from this terminal and breaker neutral bus bar? My friend said I can land the ground to it but didn't explain why. Thank you for your help in this matter. That thing you are calling a "neutral bar" is bolted directly to the steel of the switch box. It cannot be a neutral, it must be a ground. Neutral is an active, live conductor that carries current under normal conditions. It is normal for it to have "voltage drop", or more accurately "voltage rise". Ground is a safety shield, and should never flow current except during fault conditions. In your installation, your appliance does not use neutral. Cap the wire off (Put a wire-nut on it) and wrap the nut with tape because they love to fall off single wires. The stud you have neutral on, is for ground. A neutral bar would be insulated from chassis, since we are anywhere but the main panel. Conflating/interchanging neutral and ground defeats the purpose of running grounds. People tend to get misled by a couple of things. seeing the inside of a main panel where neutrals and grounds gaggle on the same bar. That is an exception because the main panel is the one location where neutral is bonded to ground to assure the entire system's voltages doesn't float wildly and stays within 120V of earth (which puts neutral quite near earth). dealing with 3-prong dryer and range connections where the neutral is attached to dryer frame. That is actually bootlegging ground, and is dangerous, except that it is legalized in those particular installations on the logic that the connections are so rarely disturbed. Since your heat pump does not need the neutral, you simply cap it off with an appropriately sized wirenut. The ground, then, lands on the ground bar in your disconnect (even though it gets called a neutral bar, it's really a ground bar here). That way, everything is safely grounded, and the neutral's available in case the heat pump circuit gets repurposed for something else that actually needs it. Not the answer you're looking for? Browse other questions tagged electrical wiring grounding 240v heat-pump or ask your own question. Can I install an additional breaker bus bar on my main breaker panel? 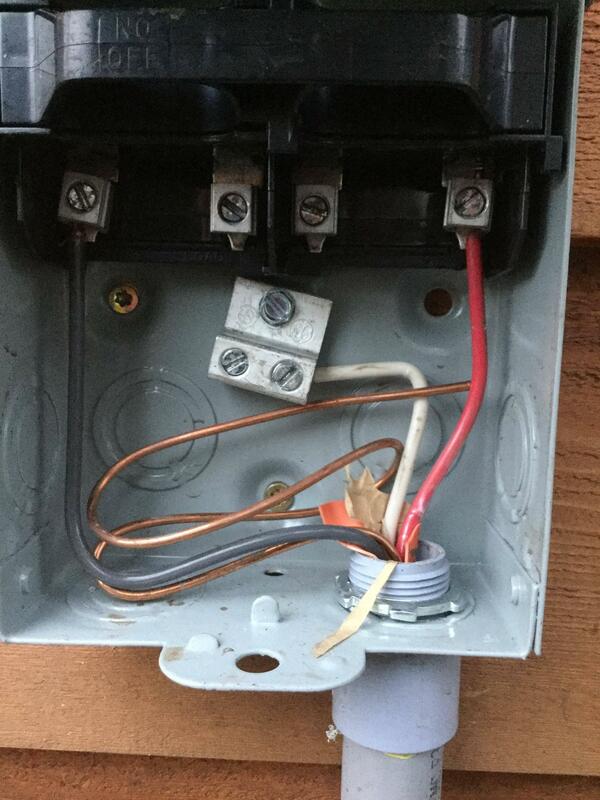 Where in the breaker box should I terminate the neutral wire from my dryer circuit? In a secondary panel, are grounding and neutral bus bars required on each side of the hot bus bars? How should grounding be handled for multiple RV pad feeds? How to add a gfci and surge protector to pool pump line? Is my subpanel wiring safe and correct?